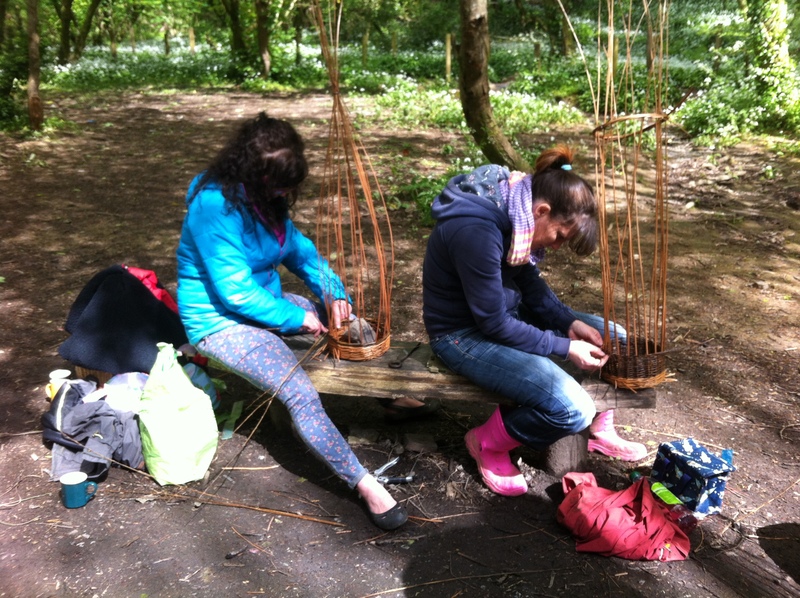 On a lovely sunny Sunday we bundled bodkins, snippers, irons and sticks into our bags and set off to the beautiful Bishop’s Wood, located just behind Caswell Bay on the stunning Gower coastline. 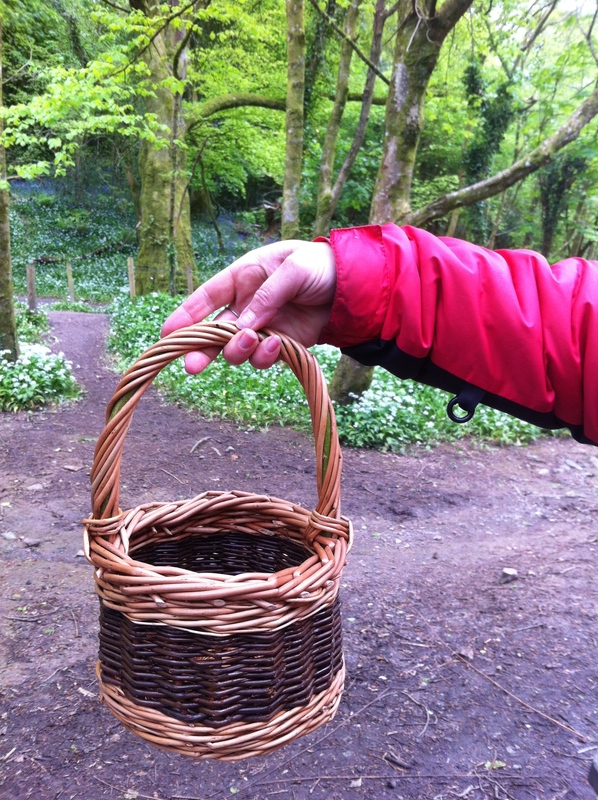 With the intoxicating smell of thousands of wild garlic and their delicate white flowers mixed with swathes of bright bluebells nestled under towering trees, it truly was a sight and smell to behold as we approached the log circle deep in the heart of the wood. 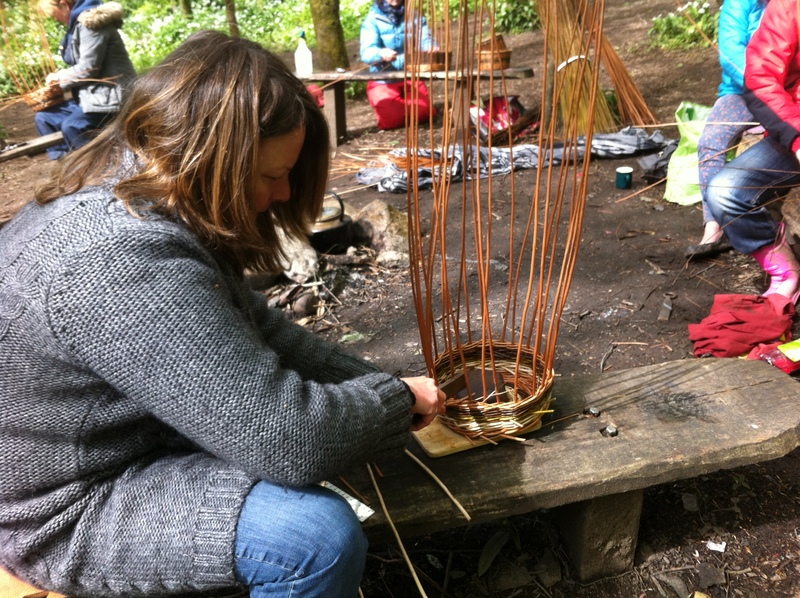 Eight intrepid weavers looked excitedly on as we explained and demonstrated the age old methods of making a small, round stake and strand basket before they set to work on their own mystical first basket journey. In fairness a few had already begun their journey so were up and running quite swiftly, so we challenged those with different weaves and the prospect of putting a handle on if they shifted a bit. The complete beginners were taken through the process slowly and gently, nurturing their first grasp of the willow sticks, encouraging them to work with the curve, wiping brows as they puffed through pairing, challenging them to push those side stakes in a bit further, watching until they were well and truly relaxed with waling until their beautiful baskets started to emerge. The day flew by as the baskets flew up and before we knew it, it was border time. 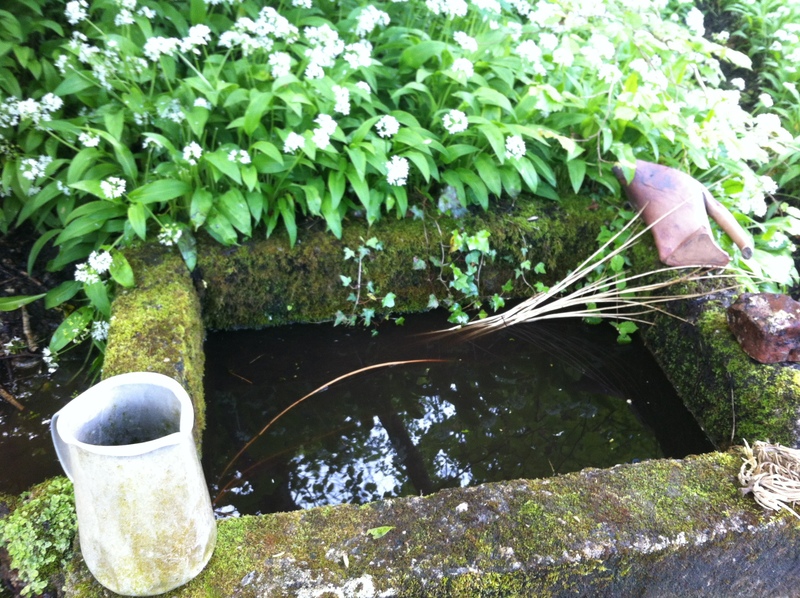 Using buff outside on a warm day with a slight breeze on the air was always going to be a challenge and despite copious amounts of spraying and dampening down there was no alternative than to take the baskets up to the well and give them a 10 minute dunk to be workable. 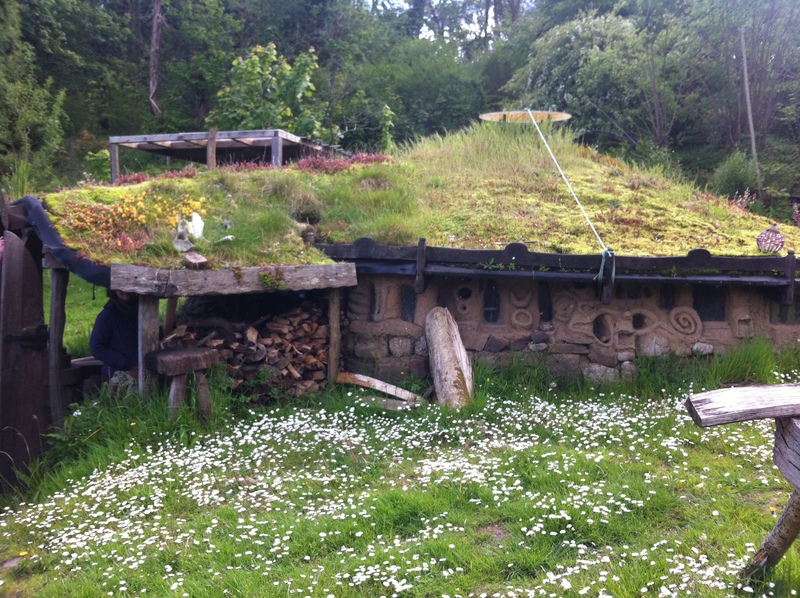 What a joy that turned out to be, we got to see the fantastic roundhouse built by landowner Dai, complete with outdoor kitchen and cob oven plus his fantastic willow chairs, while our basket babies were baptised in the well’s trough, magical. 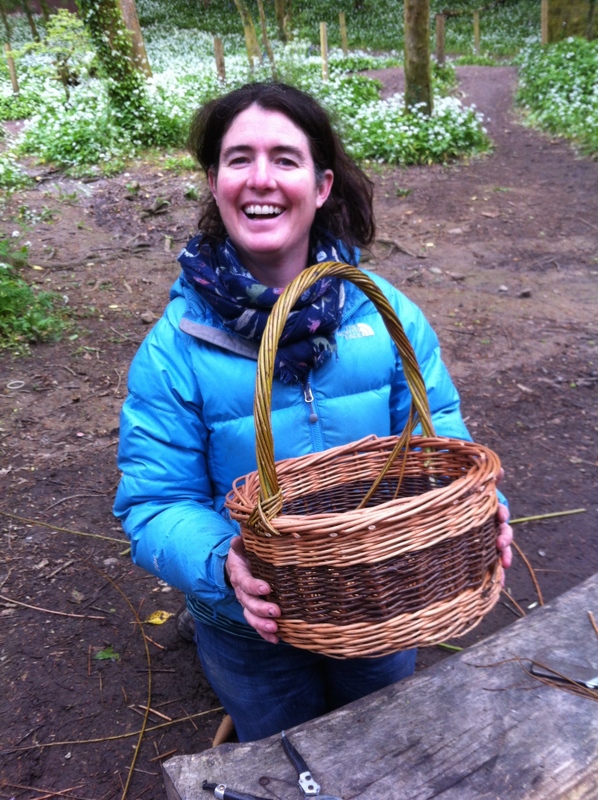 Borders complete and handles for a few, it was so lovely to see beaming faces clutching new born baskets, a wonderful end to a perfect day of willowing in the woods. 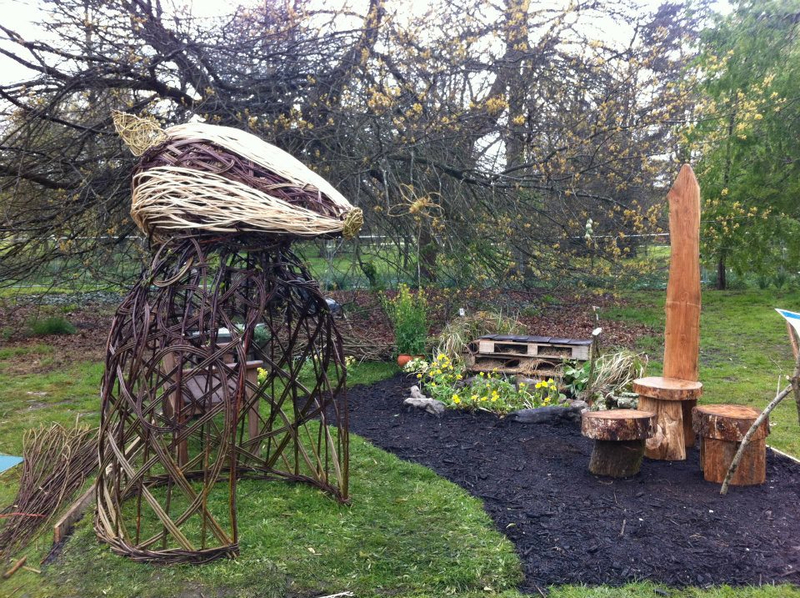 This year we’ve been lucky enough to be commissioned for several lovely sculpture projects. Some have been a lot bigger than others, a hard old slog at times, but nevertheless all very rewarding. 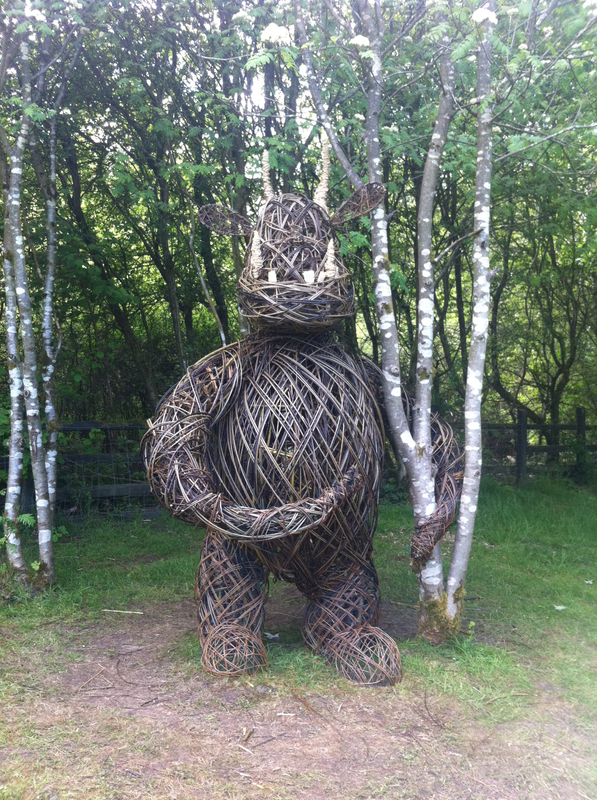 Set in 500 acres of Welsh woodlands and pasture and bordering the Brecon Beacons National Park, there stands a willow gruffalo peaking out from the trees overlooking the children’s play area. 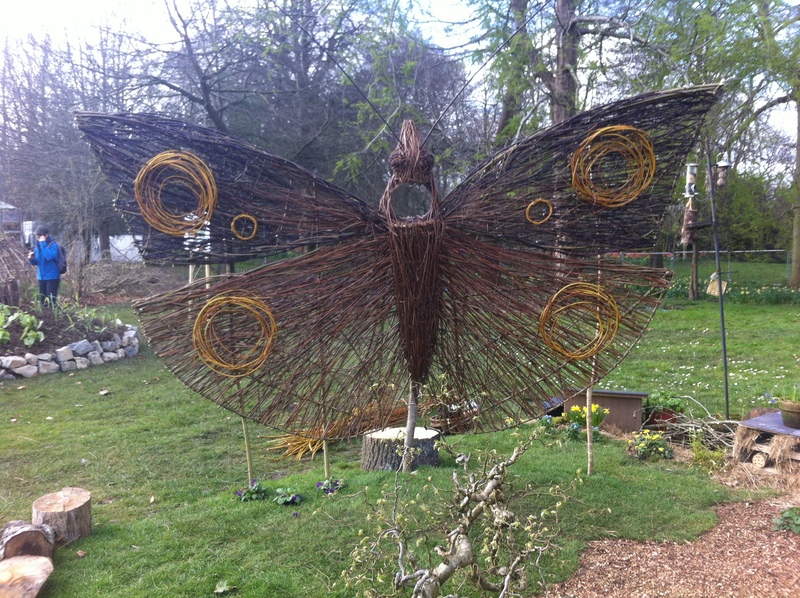 This handsome fella was lovingly created by adult and children helpers who worked with us to build the main structure and fill in with a creative bit of weaving during May 2013. 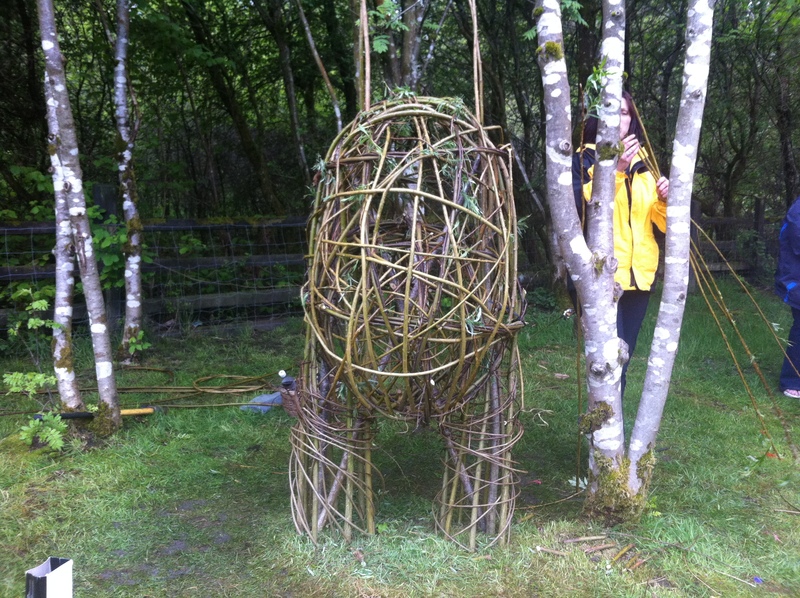 The head, which took a whole day, was done at home and attached a couple of days later, hopefully no children were traumatised by the sight of the headless gruffalo in the interim. 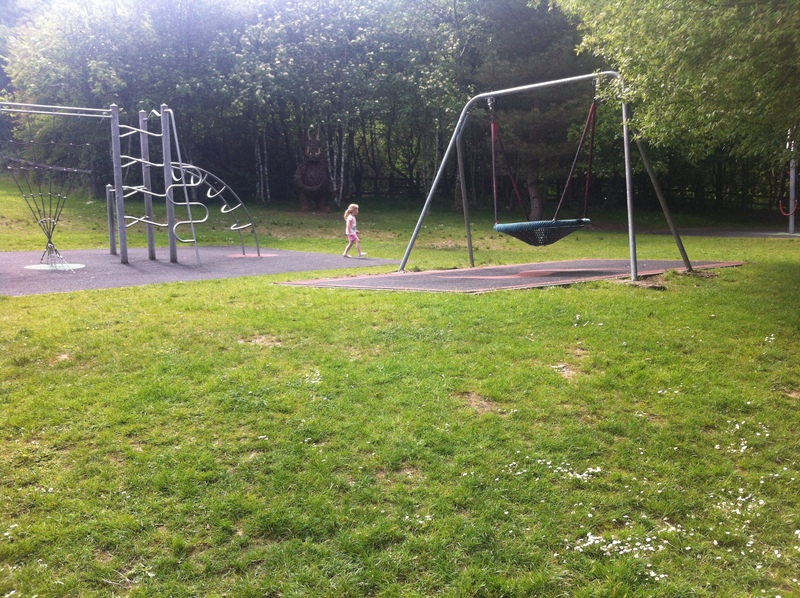 Last reports were that both children and adults were enjoying his company. 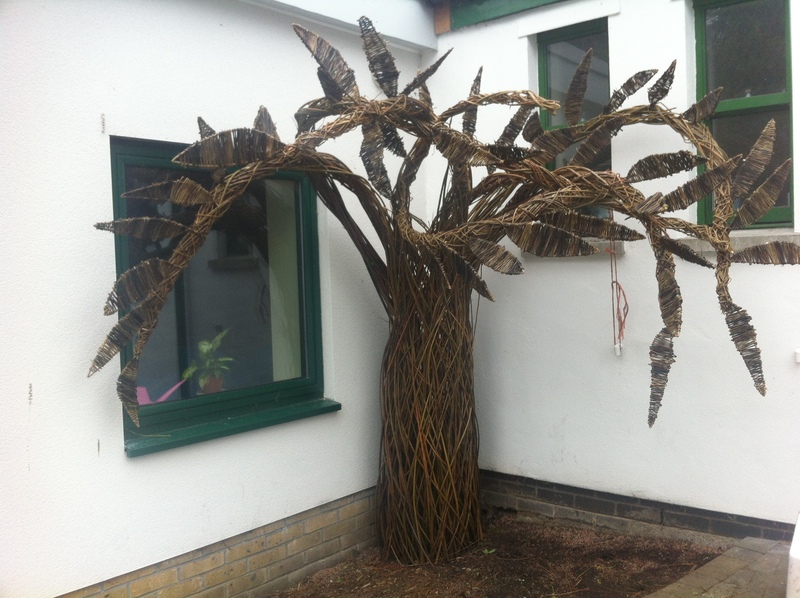 Back by popular demand a willow tree has sprouted at Pendoylan Primary School. 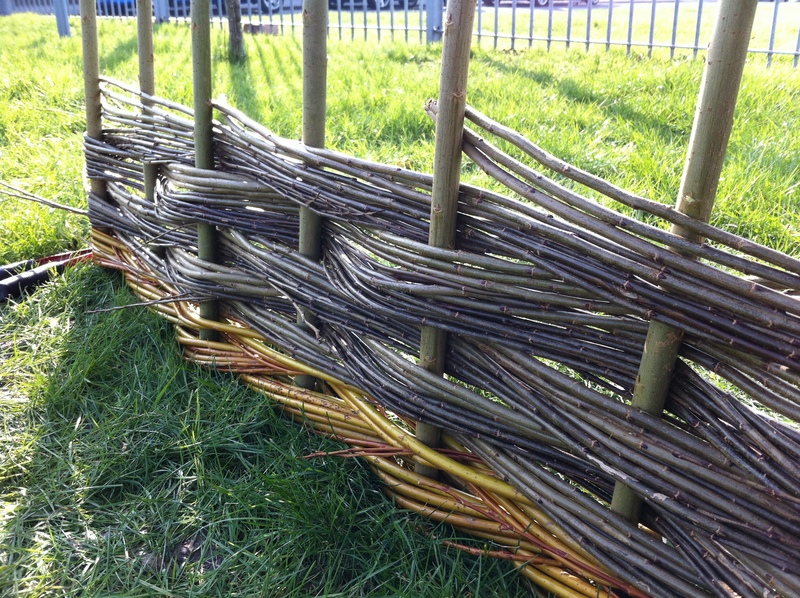 Over two days all the children had a go at weaving the main structure of the tree whilst some wove beautiful leaves which were attached to the branches at the end. Sitting in a corner of the yard the tree is a place for reflection and storytelling. 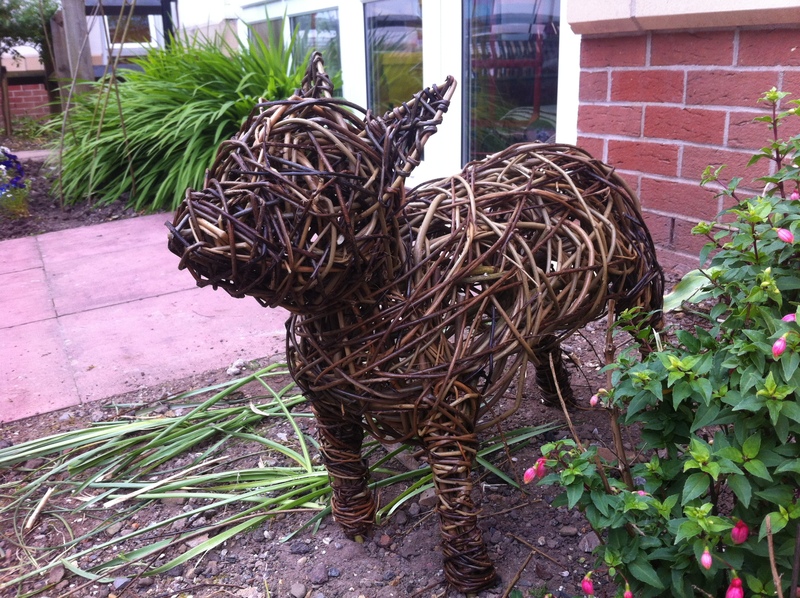 We’ve been asked to do some unusual sculptures over the years but never a lifesize willow Toto. 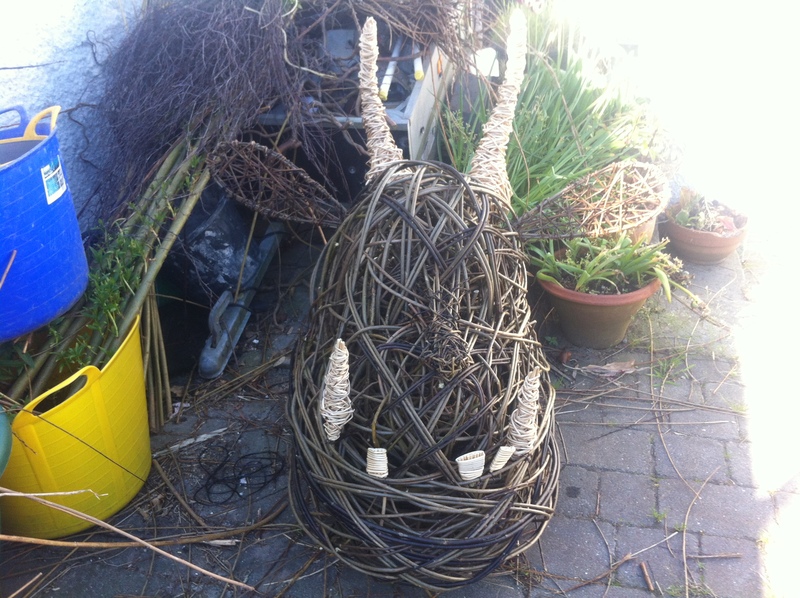 Residents of Ty Enfys care home in Pentwyn joined in the afternoon session of weaving to create the famous furry canine as part of their Wizard of Oz themed garden display. 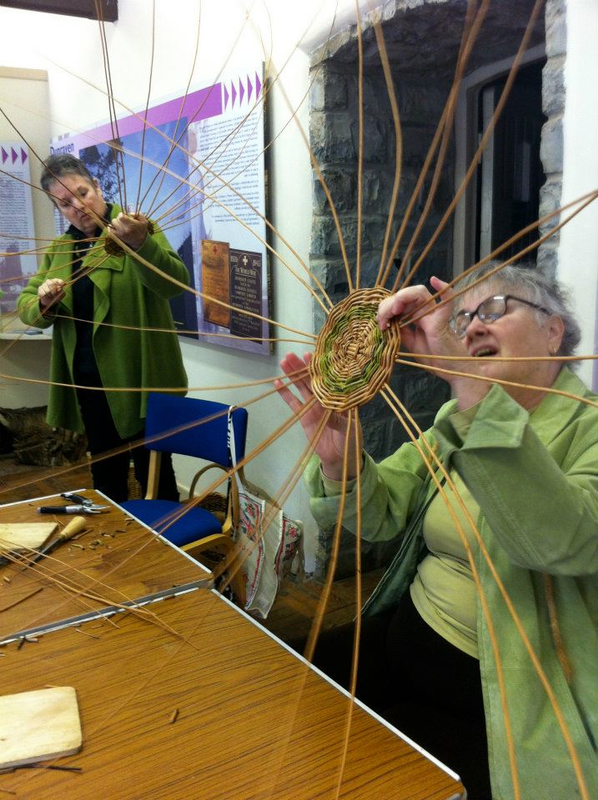 The residents are pretty experienced willow weavers as this is the third time we’ve been back to run a workshop. 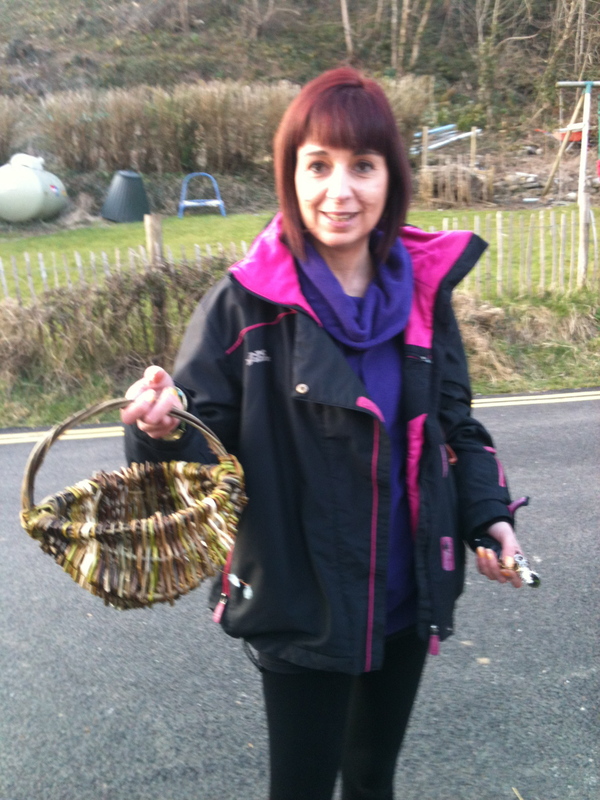 Willow garden trugs are filled with the fruit and veg from the garden, at Christmas willow decorations hang on resident’s doors and at 90 years old Naomi, our star pupil had her first willow experience making a beautiful basket for her granddaughter. Fantastic News – we have been shortlisted for the Creative and Cultural skills national Crafts Skills Awards in the category ‘Engaging new and diverse audiences in Craft Skills’. 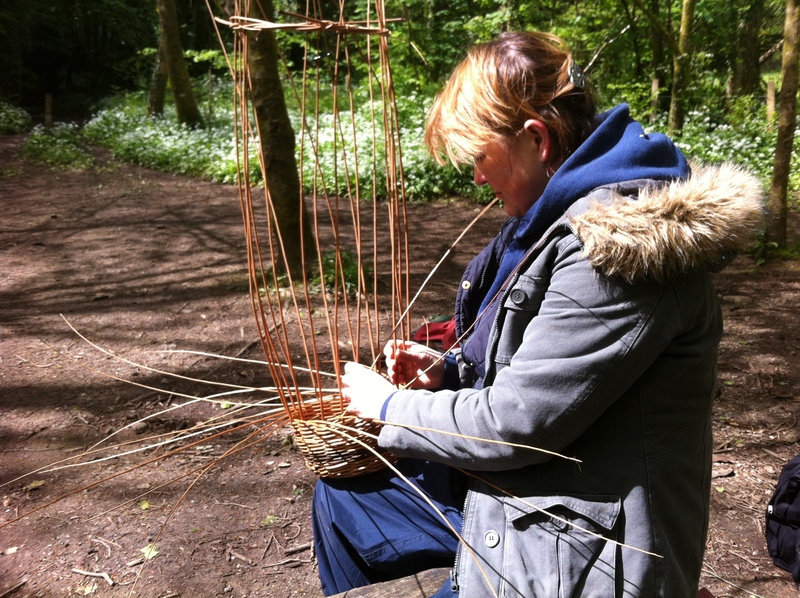 We are applying for this award as we are incredibly proud of our wide variety of educational, hands-on workshops and courses, teaching the art of willow weaving and basketmaking to adults and children. Our audience ranges from nursery school children, young offenders and residents of nursing homes to the general public. We have worked all over South Wales, and beyond, passing on our own skills to many thousands of adults and children. We are passionate about our work and absolutely committed to reaching as many people as possible to enable them to experience this incredibly rewarding and ancient craft. We provide high quality instruction through a variety of workshops and courses. 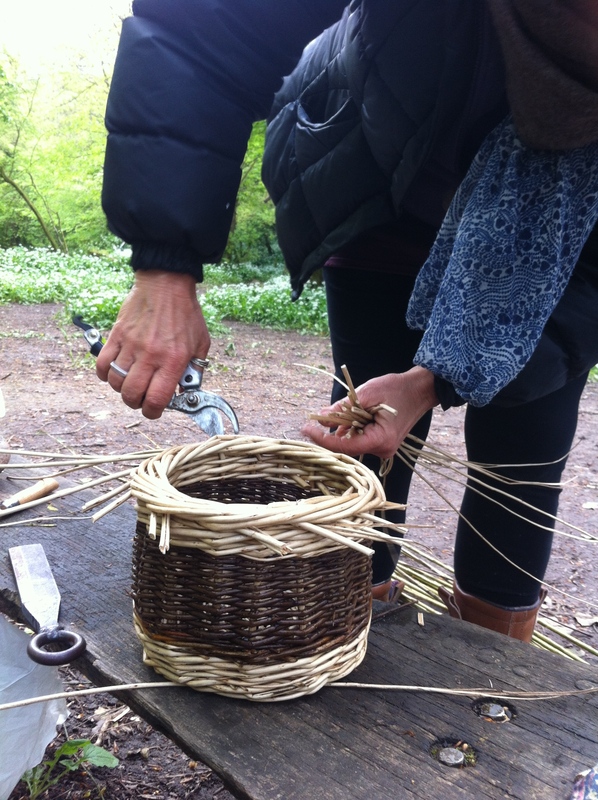 Basketmaking Courses – 1 day, 2 day, 5 day Residential and Progressive Basketry Courses (3 innovative series of 6 courses offering structured progression of learning basketry skills. 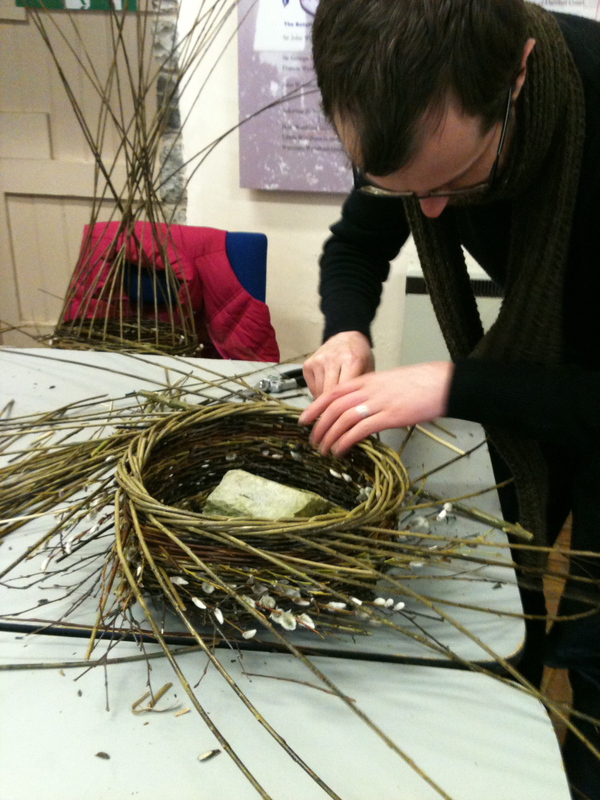 Talk and Weave Workshops – a slide show with examples of all our work and then instruction to weave a simple willow project, eg an oval shaped birdfeeder, achievable by everyone. We encourage the highest of standards and always urge students to strive for excellence in their craft skills. 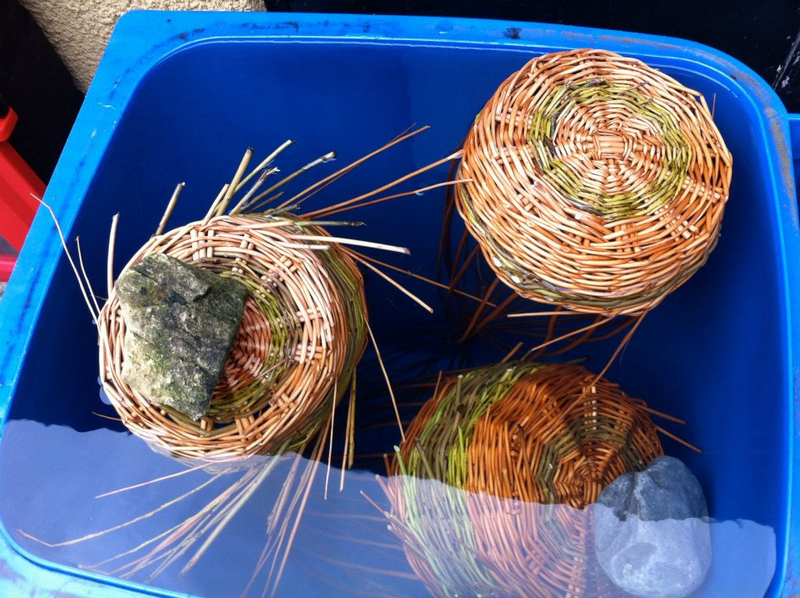 Students are encouraged to take part in progressive basketry classes where we keep detailed records of learning so that we know which skills students have covered individually and then can advance their individual skills accordingly. Individual projects are evaluated at the end of each course and students given targets to improve on. 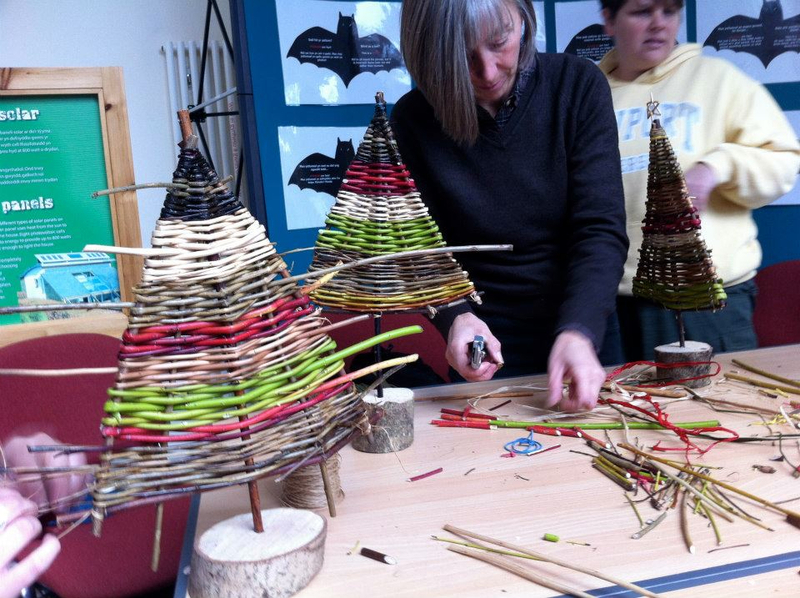 During our courses and workshops we teach skills needed to produce projects that are achievable in the time available. 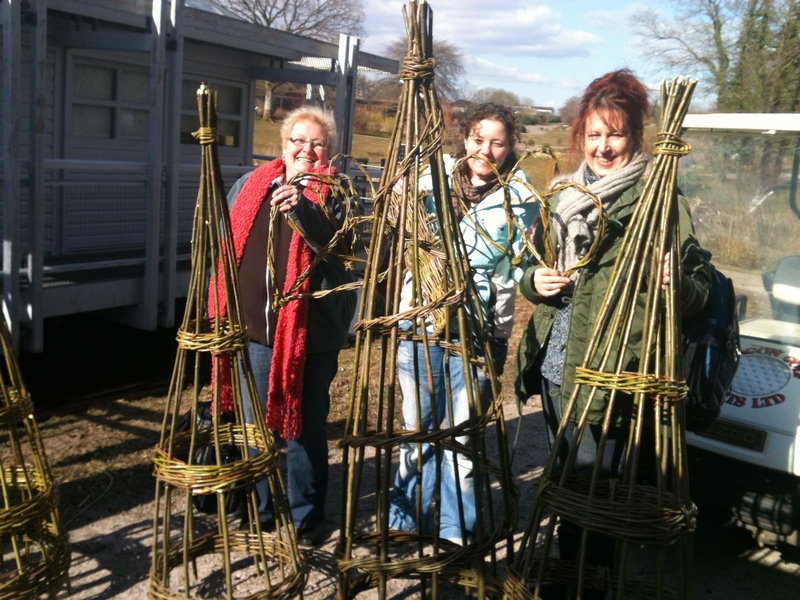 At a show or mini workshop we will teach participants to handle willow safely and learn a simple weave in order to produce an easy project such as a heart or birdfeeder. 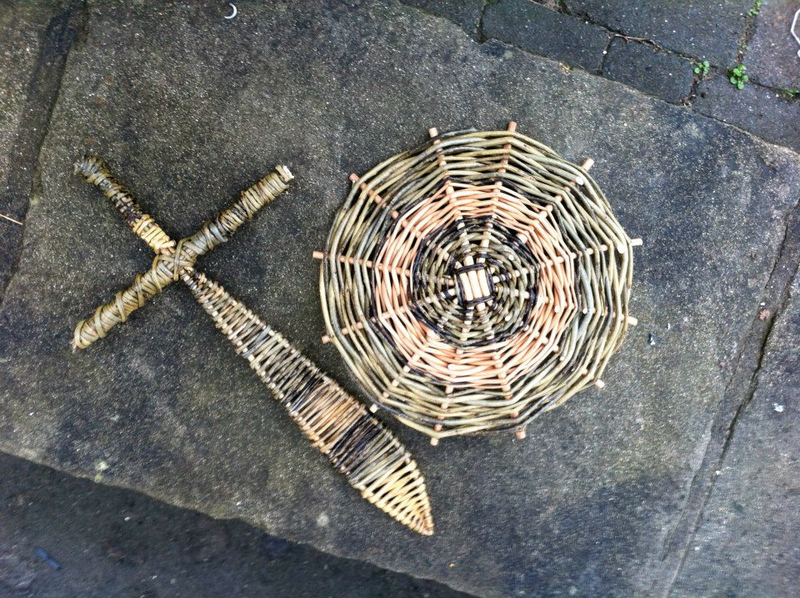 On longer courses students will learn specific skills to produce more complex items such as baskets or garden structures. We always stress the highly skilled nature of the craft and have high expectations of our students. Most people are extremely proud of their hand-produced items and eager to continue learning. Since 2006 our one-day courses have provided 982 course places. 35 students have attended our Progressive courses. Our school workshops have reached approximately 5800 children. Our teacher’s courses and workshops have trained 1000 adults who work with children and young people in schools and in the community. 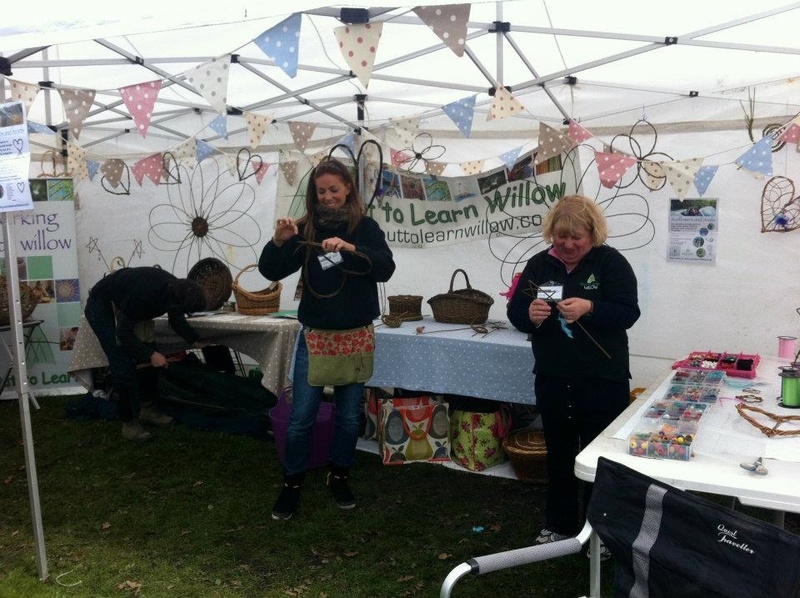 We have worked with around 2500 adults and children at shows, most of whom have never experienced willow weaving before. Many show visitors attend courses after meeting us. We have worked with around 2400 adults and children during community workshops and talks. 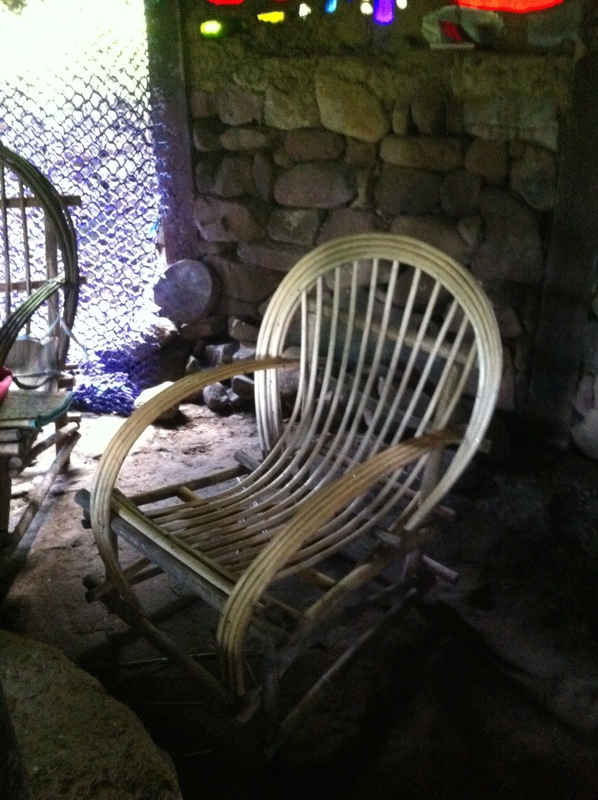 Many students stress the therapeutic nature of our workshops saying they are relaxing, satisfying and absorbing. 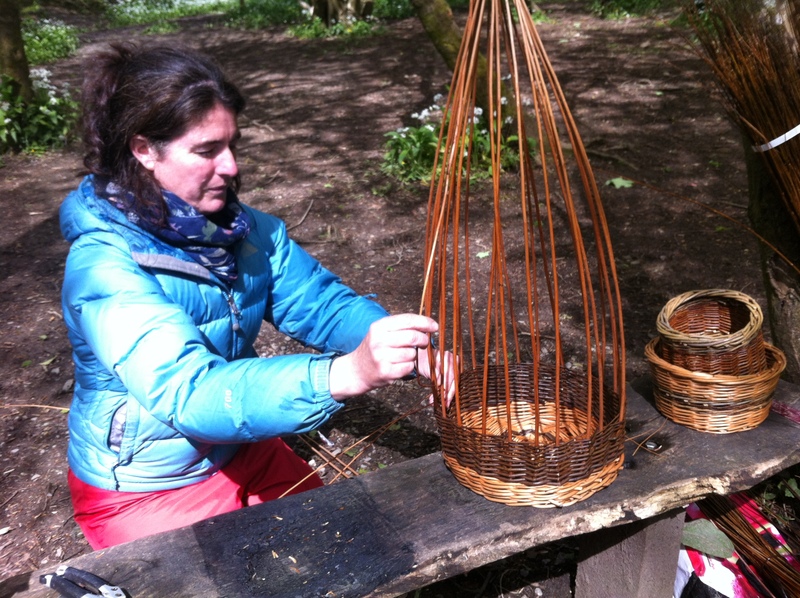 One student told us that the day she learned to make her first basket was the day she began to recover from a gruelling divorce. 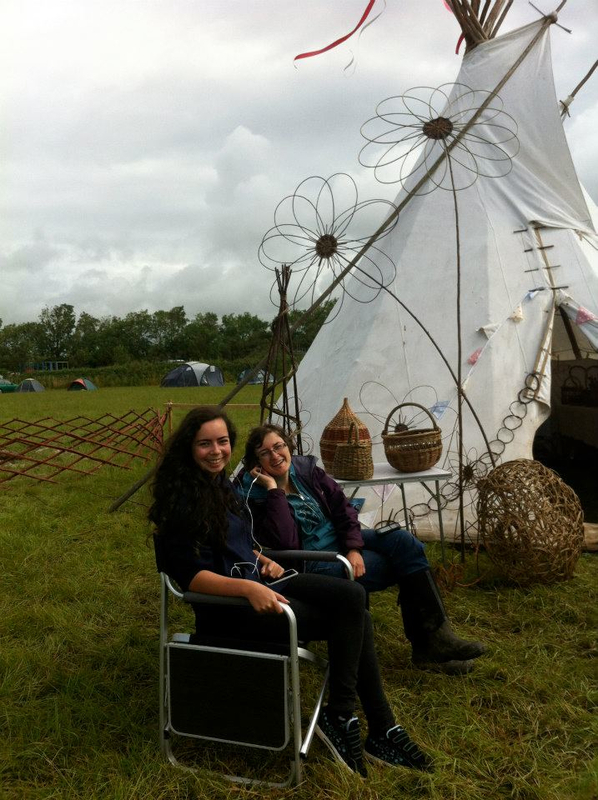 ‘Clare and Mel have revived the craft throughout the area with their enthusiasm, hard work and commitment. 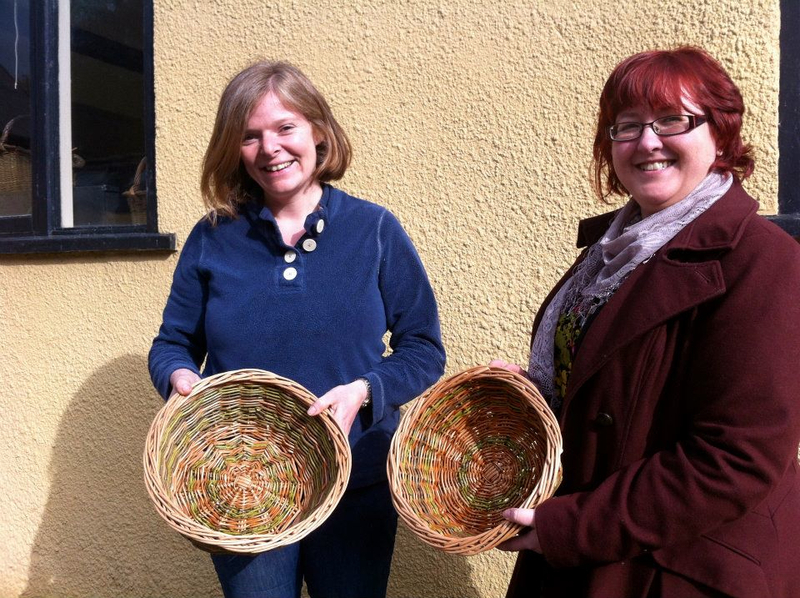 I am particularly impressed with their “progressive” basketry courses and their work with children and schools’. 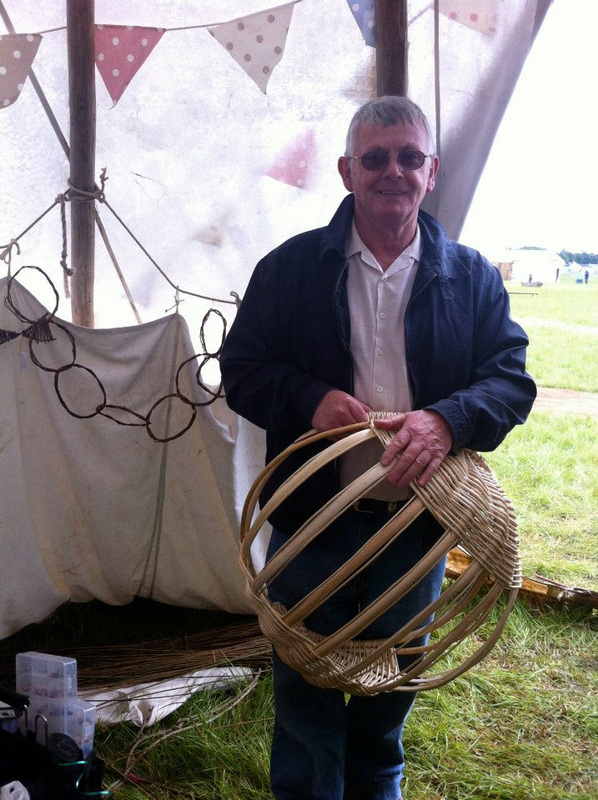 Bob Summers, past chair of Oxfordshire Basketmakers. Are we proud to be shortlisted? You bet we are …..
…needless to say we were pretty sick of the sight of them by the end. 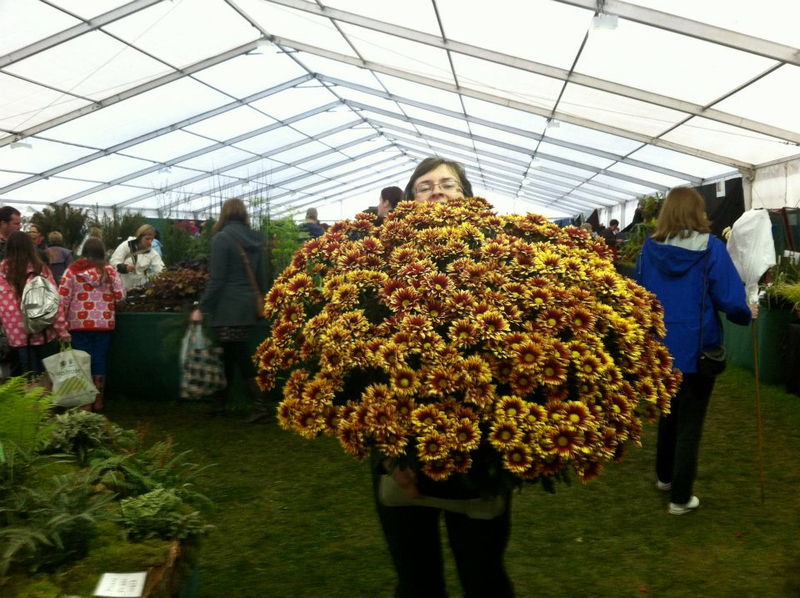 Nearly up to date – August was quite a busy month as well with The Eisteddfod and the Vale Show. 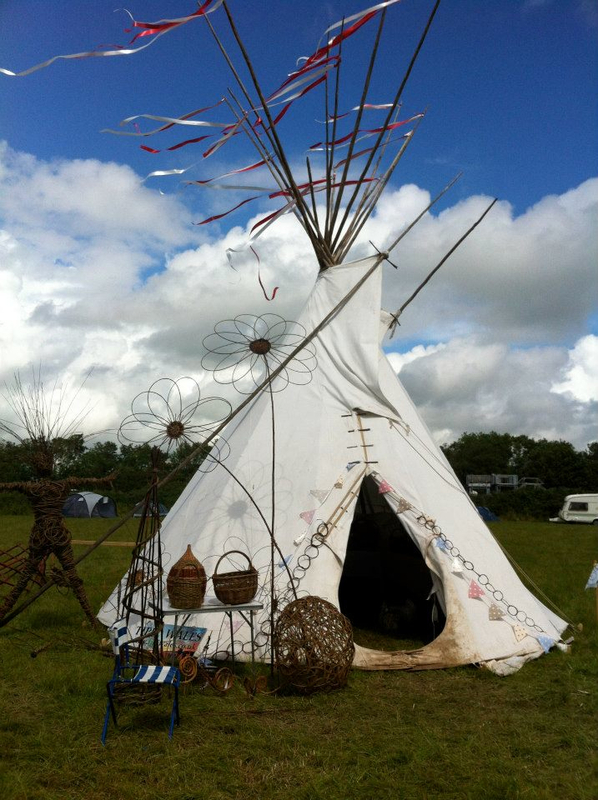 We had a rather fetching teepee at the Eisteddfod and spent a very relaxing week on the Maes Gwyrdd. 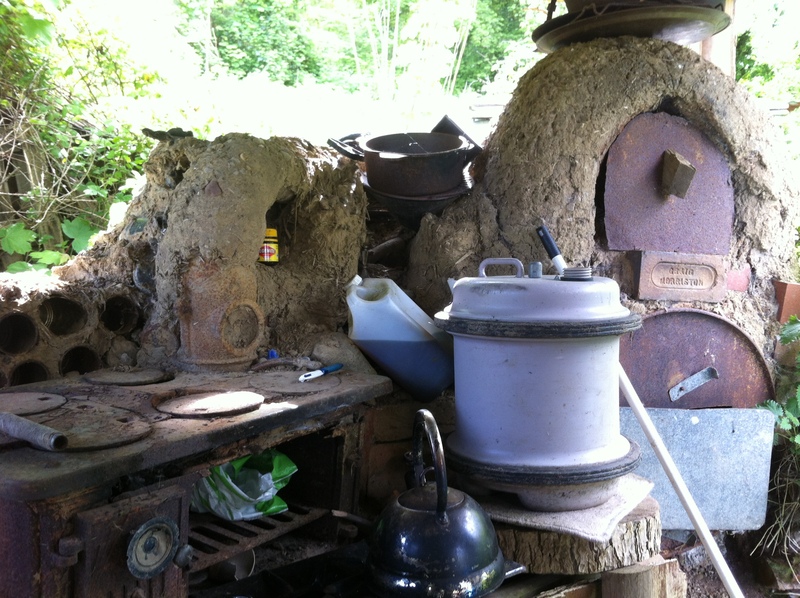 Les Llewelyn, our famous Cyntell maker demonstrated for two days making a beautiful white cyntell. 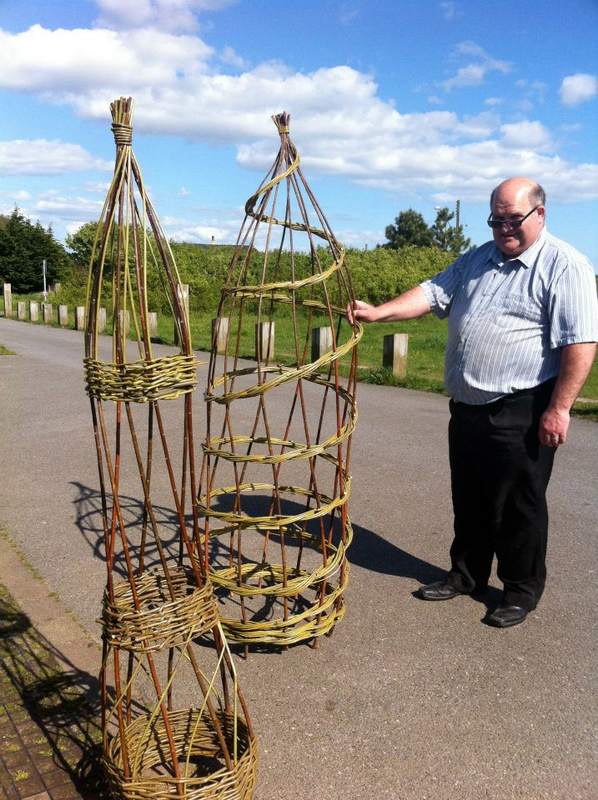 What better than willow swords and shields for a Roman Military Spectacular at the Amphitheatre in Caerleon. 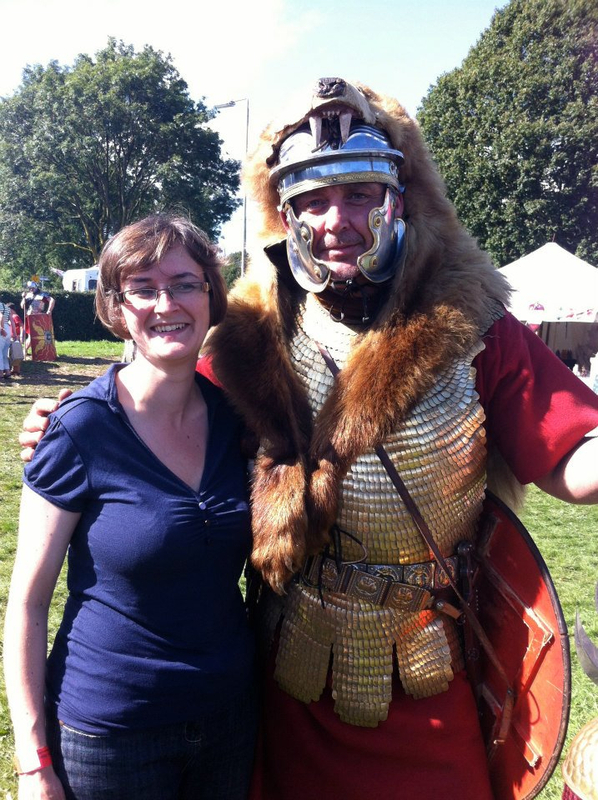 The event lasted for two days and we were treated with fantastic Roman Soldier battles and sparring Gladiators. 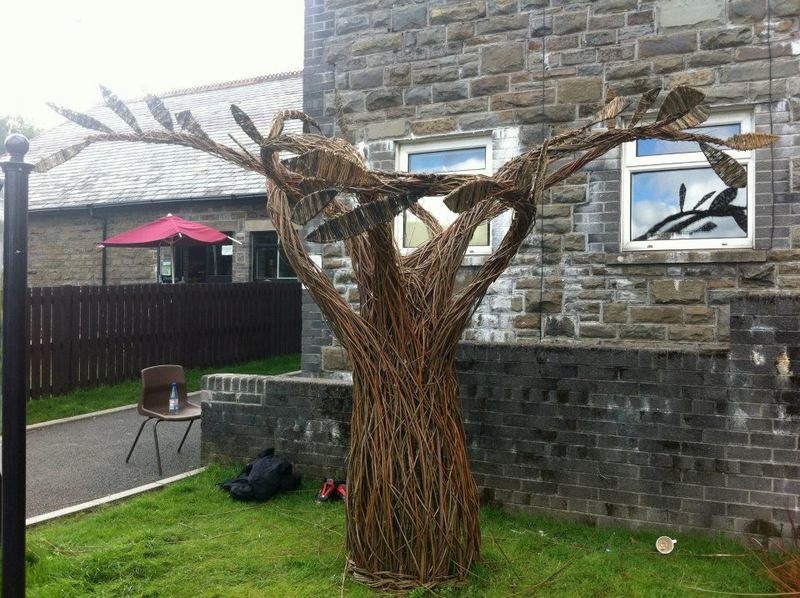 Another lovely project was a sculpture of a Storytelling Tree in Dare Valley Country Park. Spread over three days the workshop was for local children who either worked on the tree or made leaves which we attached at the end. How time flies, can’t quite believe it’s six months since we last posted. 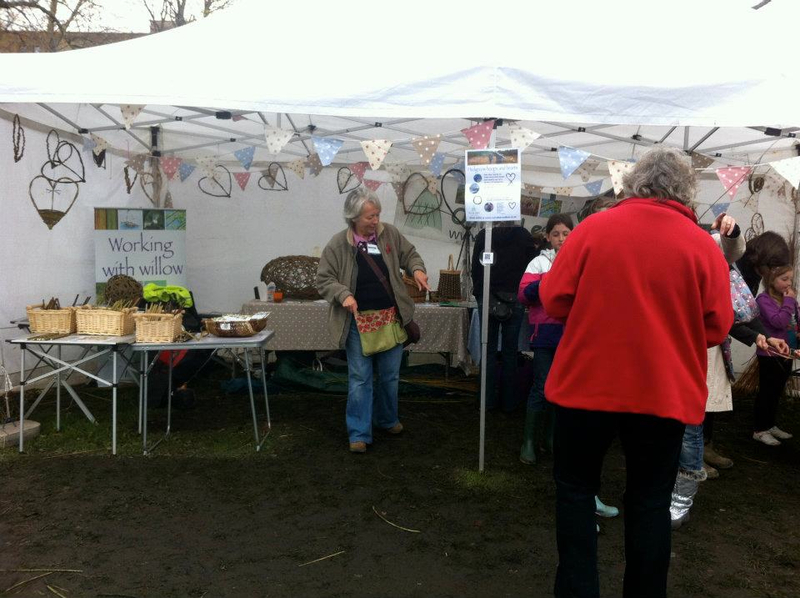 So here’s a quick update on what willowing activities have come our way since March 2012. 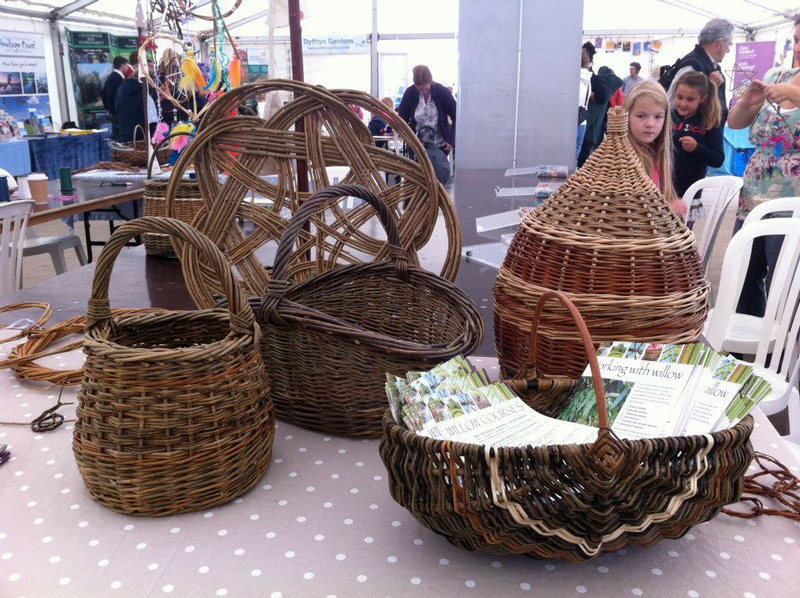 With the living willow season finished it was straight into the willow craft season which included the RHS Show in Cardiff and lots of willow courses. 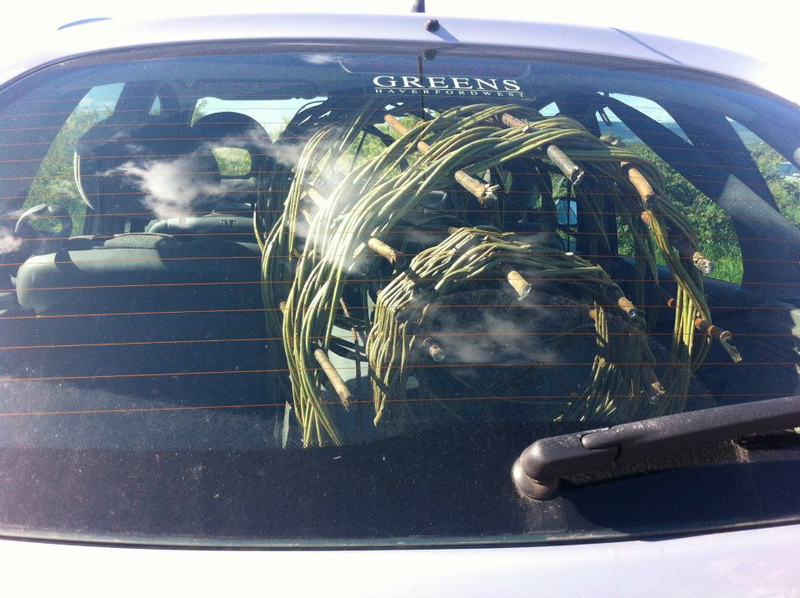 Willow Crafts for the Garden is always popular and although every time we say remember the size of the car you came in, quite often this happens. 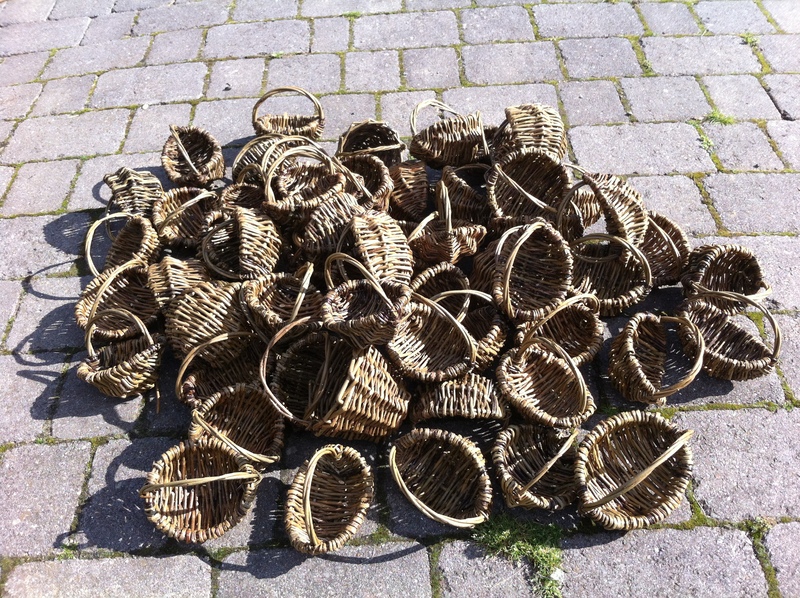 Beginners basket making are also very popular and we had some lovely baskets made in April at the Heritage Coast Centre in Southerndown. We even had two lovely ladies fly all the way from America. Back to the wheelie bin for soaking though. We’ve been lucky enough to have a stand at The RHS Spring Show in Cardiff for the last four years and although a tiring three days, it’s always a lot of fun. 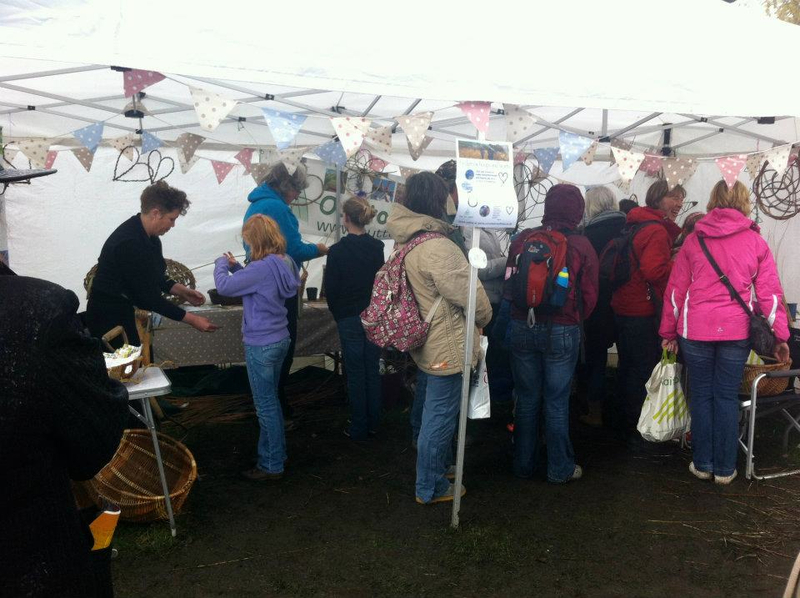 This year the weather wasn’t so kind and it ended up a bit like Glastonbury outside our marquee. 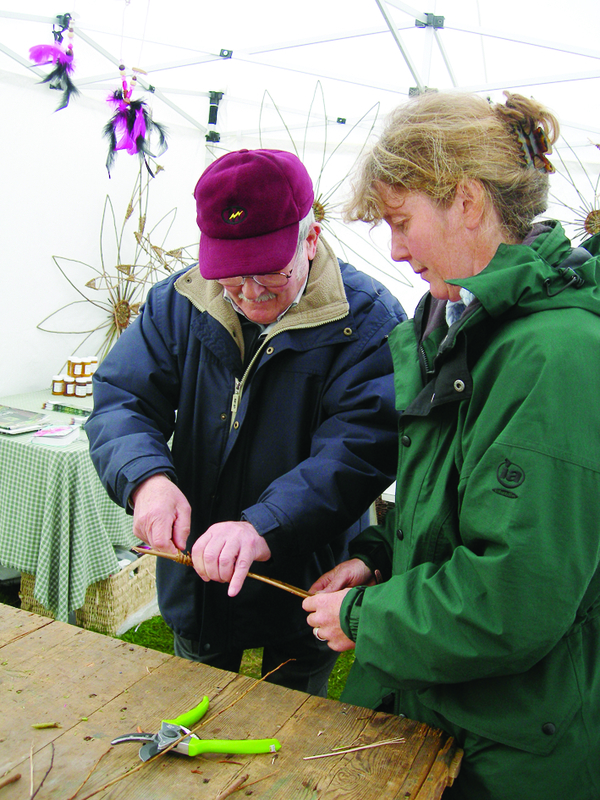 Many thanks to all our helpers, especially Sarah who stuck it out for the three days and most importantly helping to take the stand down, something not easily forgotten 🙂 We also made a willow badger for the Wildlife Trust Garden so it seemed as if we were living on the show ground for about a week. 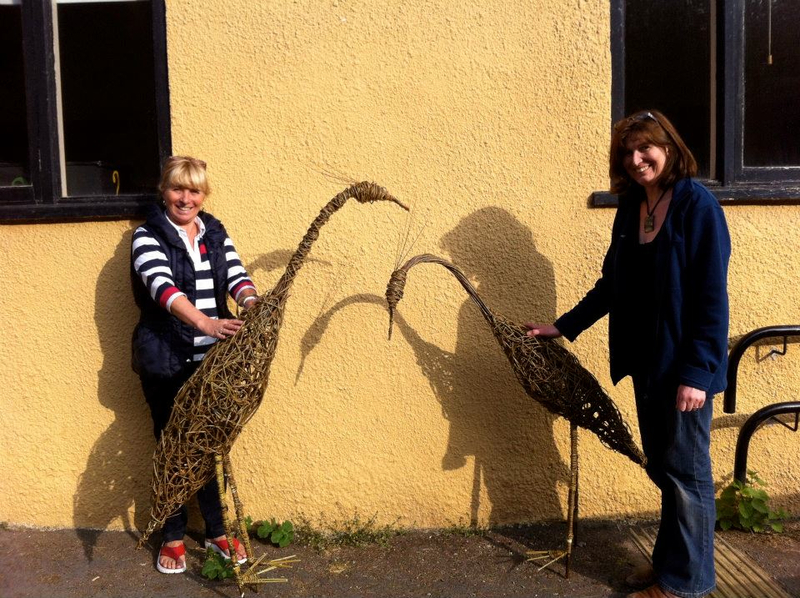 Four herons and a dolphin were made on our sculpture course, how amazing are they! 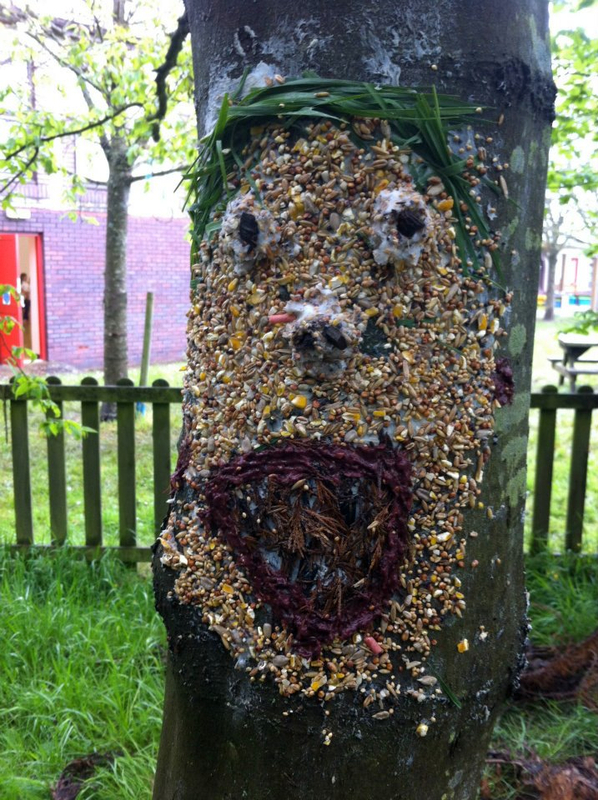 Forest School sessions started again, one afternoon a week for ten weeks taking a group of ten and eleven year olds to experience the outdoors and learn about their environment and to have fun of course. 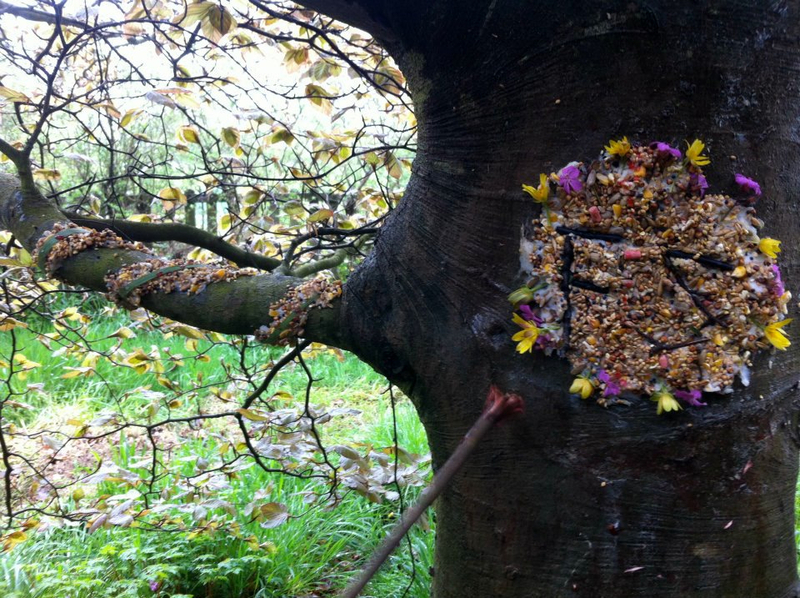 Some lovely tree art went on in the first session, sadly rained every single Thursday afternoon for ten weeks! 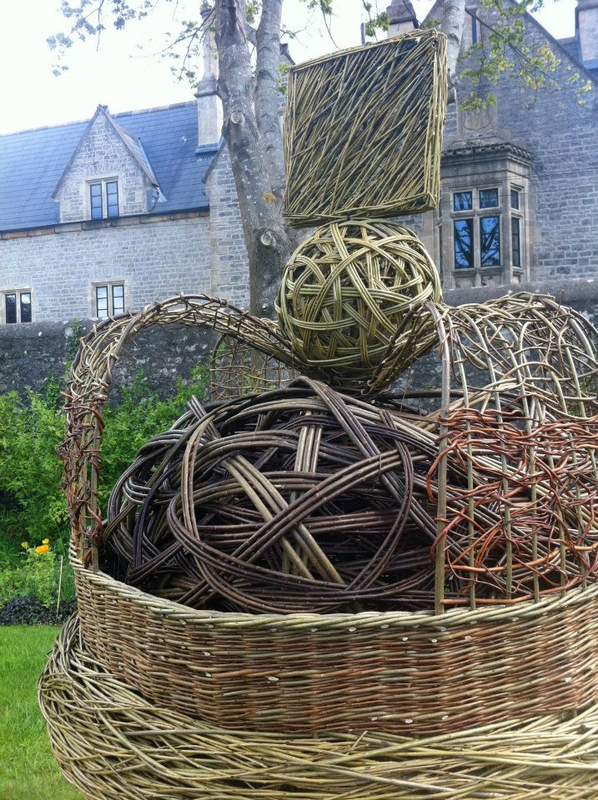 We were also asked to make a replica of the Queen’s Coronation Crown for the Physic Garden in Cowbridge to celebrate the Queen’s Jubilee. 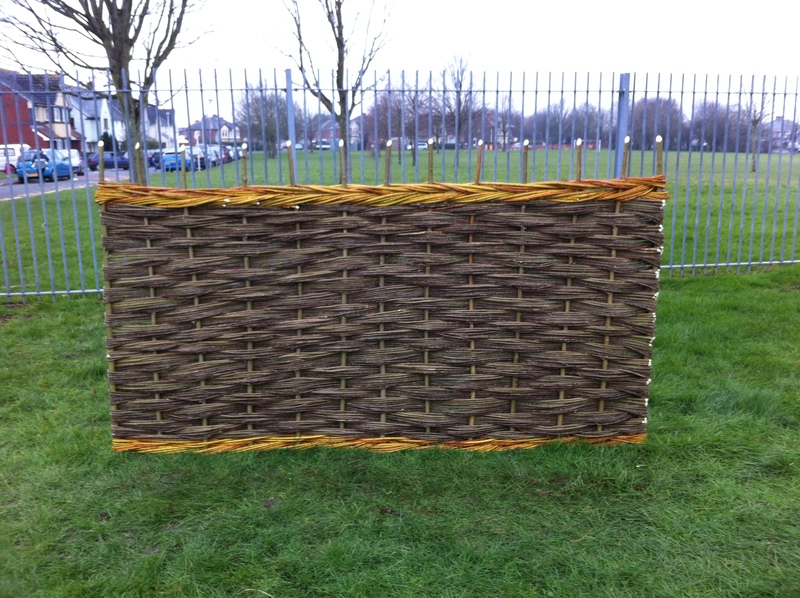 I must admit we were slightly dreading the thought of weaving willow hurdles with children on a bitterly cold day in early February so we put it off till the next day which thankfully turned out relatively sunny and springlike. 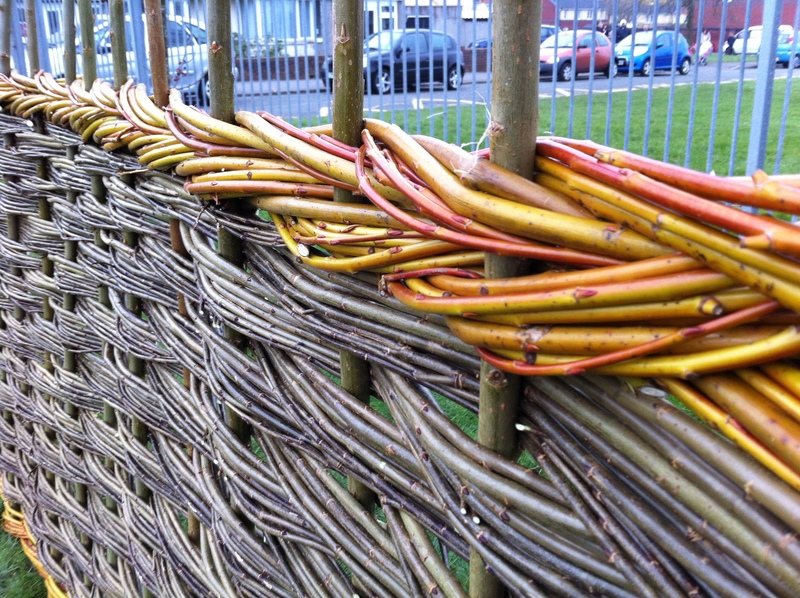 Luckily we had a nice stock of golden willow so we were able to add some colour to these panels which are going to used as screening in a nursery. The children quickly got into the swing of things as they wove the willow in and out of the uprights to the chant of ‘to me, to you’.